1. Blitz the almonds and cocoa nibs in a food processor to make a powder. 2. Add the vanilla, cinnamon and dates and blend again to make a paste. 3. 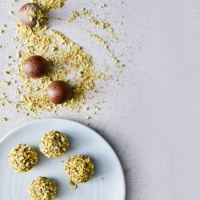 Roll into 12 balls (having slightly damp hands will make this easier), then roll the balls in the chai powder followed by the crushed pistachios to coat. Keep in an airtight container in the fridge for up to 14 days.